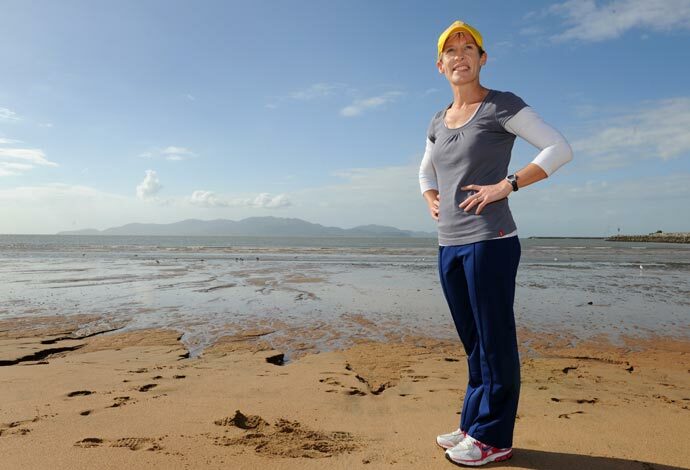 IRONMUM Janine Wilson could see she was going to enjoy the next leg of her sporting journey. Sitting on The Strand yesterday getting a few last minute hints and tips on how to cross Cleveland Bay for the Subway Magnetic Island Swim, the mother-of-two was awestuck by the view, serenity and warmth of the North. Open water swimming hasn't always been that enticing for the 38-year-old Brisbane woman who has swum virtually blind and battling sea sickness off the coast of Santa Barbara in the United States and been chilled to the bone by the waters of San Francisco in the Escape from Alcatraz Triathlon. "Swimming against the tide won't be too bad," Wilson said of tomorrow's early-morning task. "Alcatraz was against the tide and there was the race in Santa Barbara where the waves were overwhelming, it was cold and I couldn't see because the water was so murky and yuck." While the 8km crossing from the Island to Townsville tomorrow fits neatly between the New Zealand Ironman and her next grand challenge, the 19km Rottnest Channel Swim which is a precursor to an attempt at the English Channel next year, it has captured the imagination of the Australian Age Group Triathlon representative. "This is going to be great for my experience, I love the look of it ... it's exhilarating," she grinned. "I like doing all sorts of different events and go out of my way looking for them." There is something about the history of the event and long-gone tradition of doing so in shark cages that appeals to Wilson ... even if she couldn't help herself asking event president John Barrett if they were still necessary. "We are talking sharks with no teeth, right?" she asked. After learning that the only thing she needed to be wary of was coral, Wilson's race plan of not having a race plan sat well with her. in her favour. "My coach was asking me the other day what my strategy would be and had I thought about my nutrition and I said 'no' ... I'll drink when I get thirsty I guess," she said. "I'll go with the flow. I'd like to finish in less than two hours, but getting across the line in once piece will be fine."